View from the balcony of the auditorium. 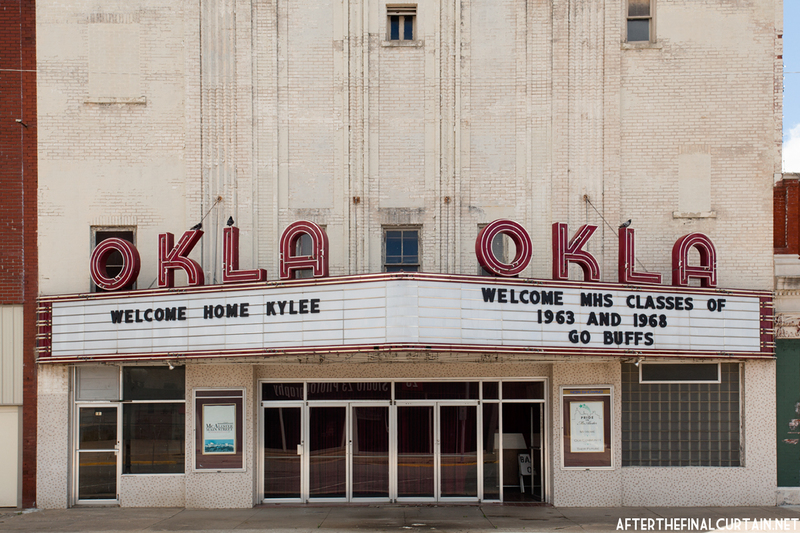 The OKLA Theatre opened on July 10, 1931 in McAlester, Oklahoma. It was built on the site of the Palace Theatre, which burned down in December of 1930. Wallace Wilkerson, the owner of the theater building, hired architect W. Scott Dunn to build a new theater on a budget of $50,000. 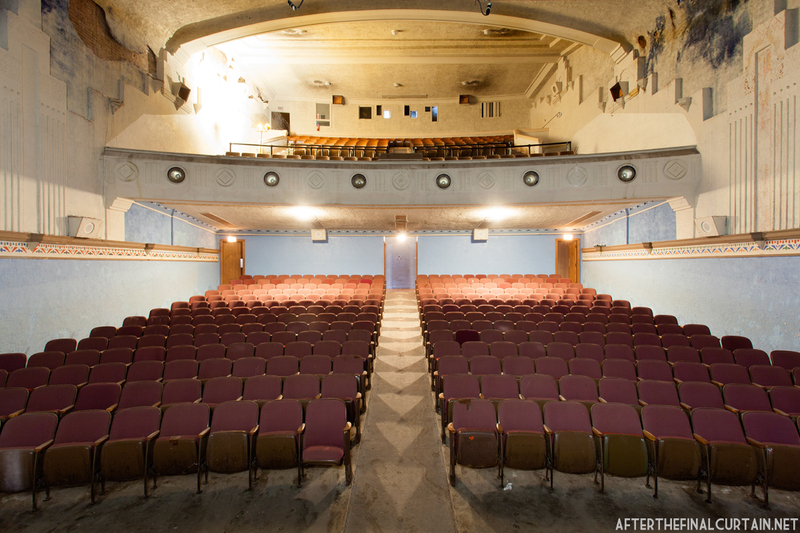 Dunn converted the existing cinema walls into a partial atmospheric style theater. 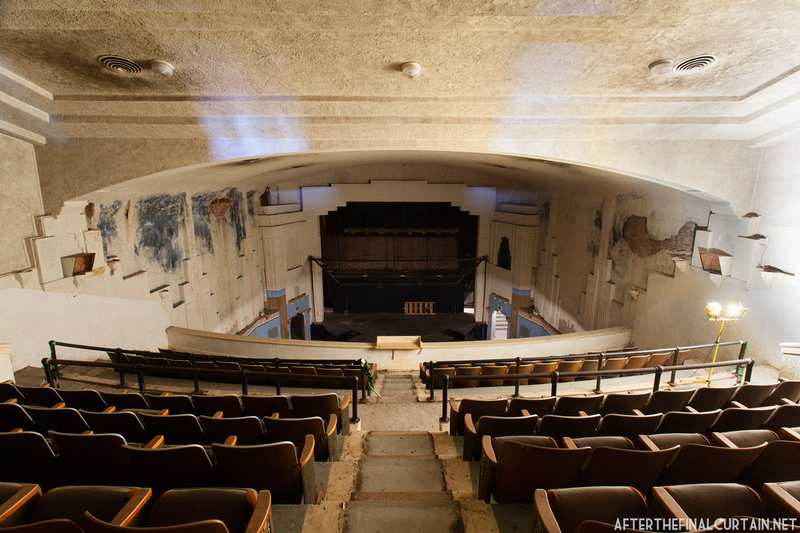 It was built for Robb & Rowley Theatres, but the lease was taken over by Howard Hughes’s theater company, Hughes-Franklin Midwest Theatre Corp LTD. Architect W. Scott Dunn called it a “revised moderne, semi atmospheric” theater. The opening day film was “The Man in Possession,” starring Robert Montgomery. Admission prices were 25 cents for the balcony and 35 cents for main level seats. The day after opening, the McAlester News Capital said that, “the theater, in the opinion of patrons, is on a par with the very best found in larger cities.” Hughes-Franklin only ran the 800-seat theater for one year before leasing it back to Robb & Rowley Theatres. In 1950, the premiere of “Rock Island Trail,” starring Forrest Tucker, was held at the theater. The movie was released on the 100th anniversary of the Rock Island Railroad line, part of which runs through McAlester. View of the auditorium from the stage. Wilkinson’s heirs sold the building to United Artists Theatres in December of 1983. 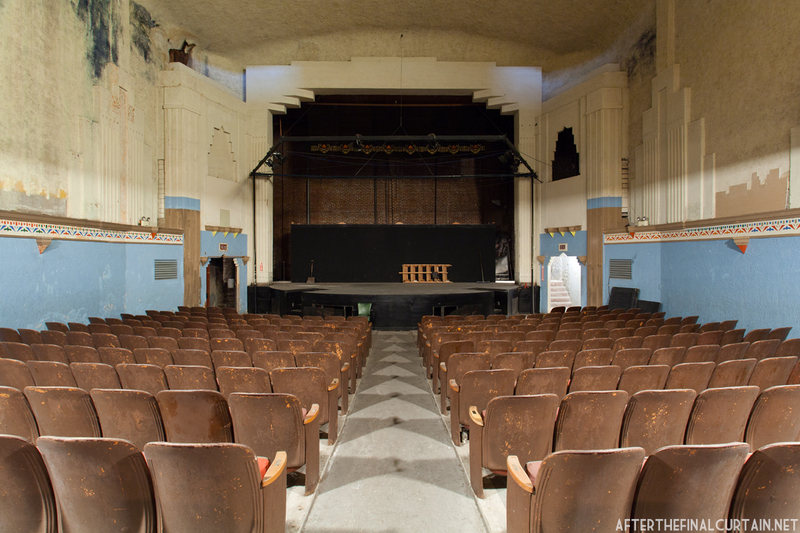 UA operated the theater for six years before closing on September 4, 1989 due to declining ticket sales. 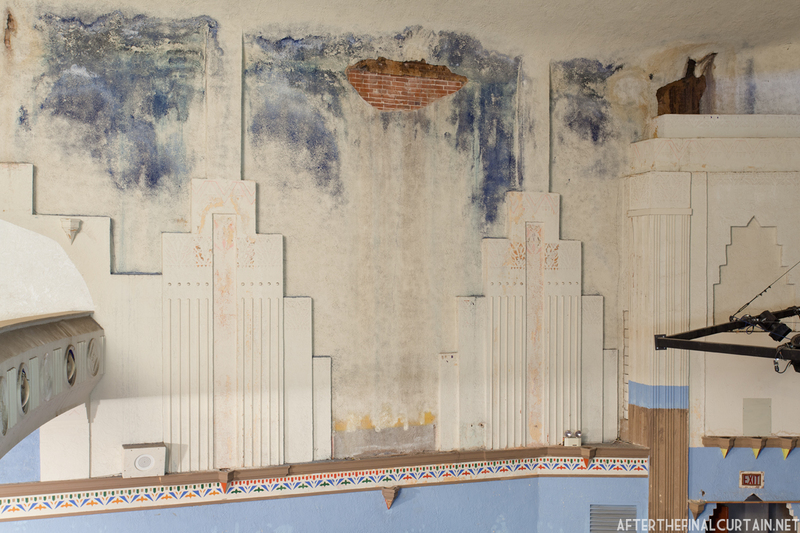 When it closed, the OKLA was the last surviving single screen movie theater in McAlester. A year later, the OKLA was bought by Kiamichi Actors Studio Theatre, Inc., a local performing arts group. KAST intended to restore the theater, but was unable to raise the funds and surrendered the deed to the bank. It was then purchased from the bank by the Ardeneum of Oklahoma Charitable and Educational Foundation, Inc. 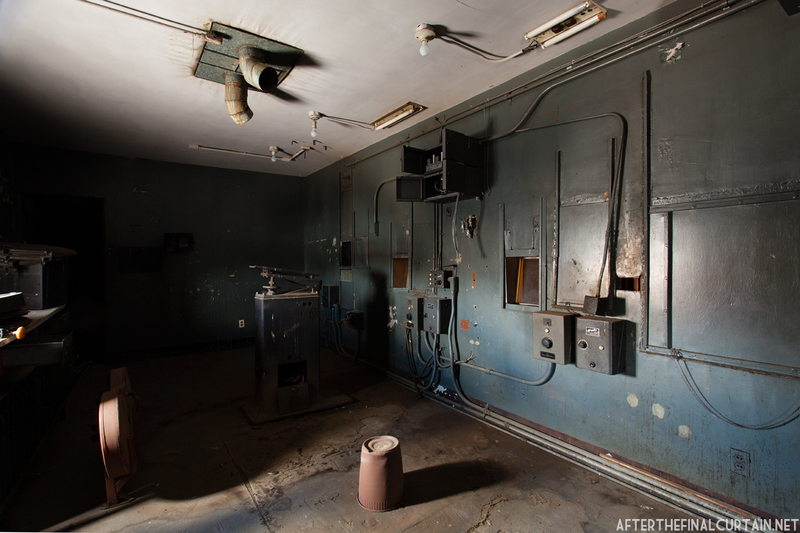 The remains of the projector room. 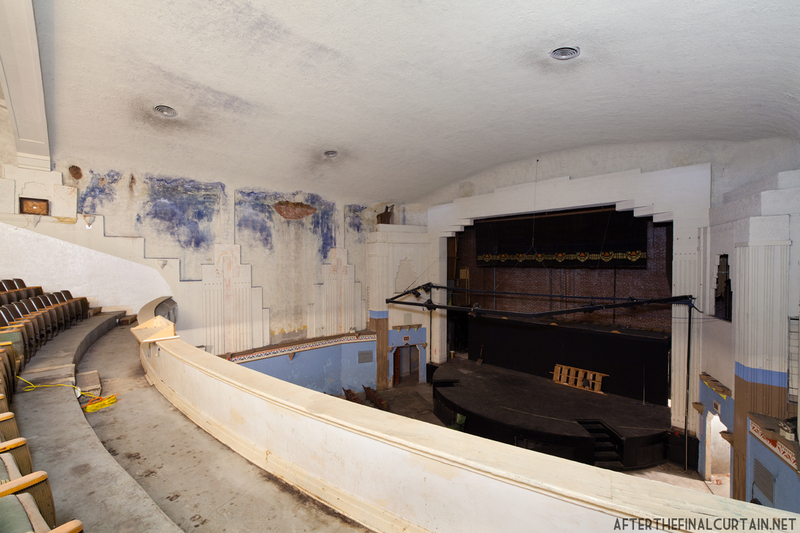 Pride in McAlester, a local community improvement non-profit organization, leased the theater from the Ardeneum in June of 2010 with the intent to restore the theater. They’ve since held several events to raise money for the restoration. 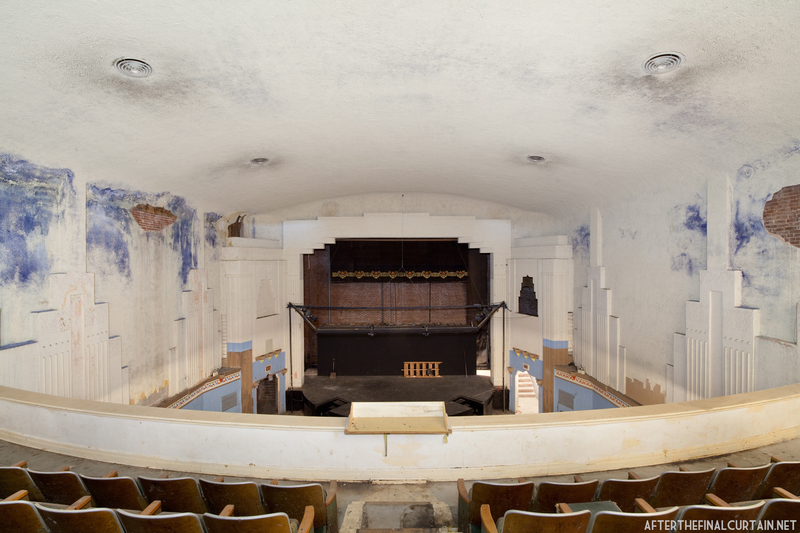 In 2012, Pride in McAlester applied for and received a $200,000 grant from the Oklahoma Department of Environmental Quality, to be used to remove the lead paint and asbestos in the theater. 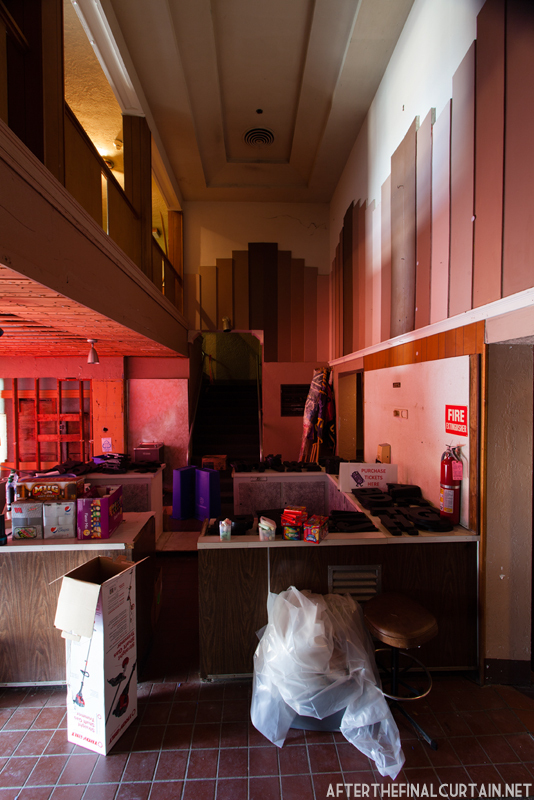 The current plan is for the theater to be used as a non-profit multi-use community center. It will host concerts, recitals, lectures, movie screenings, community theater, award ceremonies and business meetings. According to a 2010 interview with a Pride in McAlester representative, the renovations will be at least 50% complete by 2015. Donations can be made at the OKLA Theatre’s website. The atmospheric blue paint, concealed by a subsequent paint job, is beginning to show through. The lobby is currently used for storage. When the original marquee was replaced in 1948, two of the windows on the front of the building were bricked over. View of the auditorium from the side of the balcony. 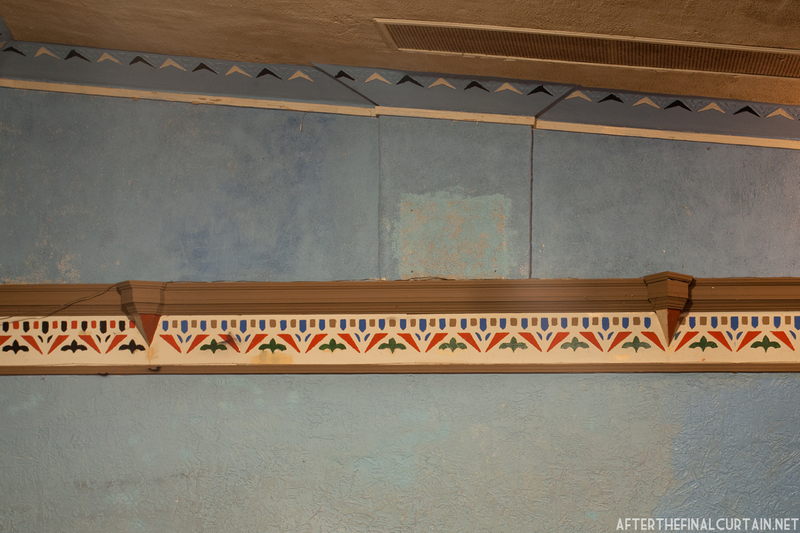 A close-up of some of the details on the wall of the main level. © Matthew Lambros and After the Final Curtain, 2014. Unauthorized use and/or duplication of this material without express and written permission from this blog’s author and/or owner is strictly prohibited. Excerpts and links may be used, provided that full and clear credit is given to Matthew Lambros and After the Final Curtain with appropriate and specific direction to the original content. The lay out for this theatre seems oddly familiar to a theatre that I am a house technician at. The one I work at is a restored vaudeville and movie house that was built in 1926. The architects aren’t the same, but would they steal layouts from each other? I’m just curious to see if there’s a connection between them. Perhaps the architect of the OKLA used to work for the architect of your theater? Let me know what theater you work at and I’ll look into it. It’s the Fargo Theatre, in Fargo ND. not much information on the building itself there.. The wikipedia page is where I found the architects. I’m sure I could talk to some people at the theatre for more information, I know we found some really neat blue prints from the original construction the other day. I saw many movies in that great theater. Was born and raised in McAlester, and it was a such a nice town to live in. Lots of great history in it. Left after my junior year in high school, but I go back for visits, as my father and brother and their families still live there. Yes, I remember when it was remodled in the 60’s. .I was working there and had a lot of fun breaking the wall down behind the seats that was there before remodeling. I also got some of the remnants of the “thick carpet” and put it in the floor board of my 1959 Dodge Coronet I would drive to work and to the 270 Drive In Theatre. I would work on the floor inside the auditorium on weekends and try to keep the ” children” quiet so the “grown ups” could hear the show. It was a chore as some of you probably remember. Those were the good ole days..